Tasty, classic smoked salmon sandwiches, with a mix of creamy Hellmann's® or Best Foods® Real Mayonnaise, cream cheese and sour cream. Great for snacks or parties. 1 Melt Country Crock® Spread in small saucepan over low heat, then stir in sour cream, cream cheese and Hellmann's® or Best Foods® Real Mayonnaise with wire whisk. Cook over very low heat, stirring frequently, until very smooth. Stir in lemon juice; turn into small bowl. Cover and refrigerate at least 1 hour. 2 Cut cucumber in half lengthwise, then slice into very thin strips; set aside. 3 Bring water, vinegar and sugar to a boil in small saucepan over high heat. Remove from heat and let cool. Add cucumber and 1 Tbsp. dill. Cover and marinate in refrigerator at least 1 hour. Drain. 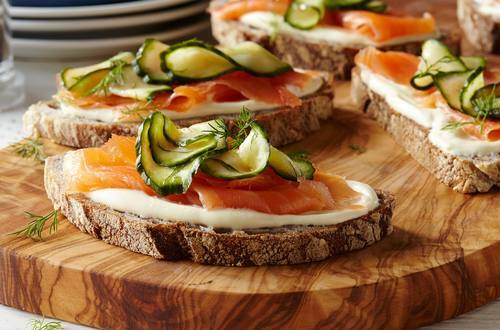 4 Spread bread with cream cheese spread, then top with salmon, pickled cucumber and remaining dill.